The Forest Service’s fire funding is subject to a budget cap based on the average cost of wildfire suppression over the last 10 years. But even as that average increases, the agency’s overall budget remains relatively flat. So when costs go higher, the agency, in a practice known as “fire borrowing,” must pull from funds intended for other programs — including those that help reduce fire danger, like prescribed burns, thinning and insect control. This vicious cycle has continued for years. “How can you run an agency when your single biggest cost is unknown?” asks Rep. Mike Simpson, R-Idaho, who has long pushed for a solution. Simpson and others hope that this year’s intense season, which burned more than 8.5 million acres, will motivate fellow lawmakers to pass legislation. In 2009, the Federal Land Assistance, Management and Enhancement (FLAME) Act, established emergency reserves for the Forest Service and the Interior Department for fighting major fires. But FLAME has been underfunded, and fire borrowing has continued. Since then, despite bipartisan, bicameral agreement that this increasingly urgent problem must be resolved, other efforts to do so have stalled out in Congress, mainly because lawmakers disagree about where the money should come from and what, if any, forest management provisions should be attached to the funding fix. 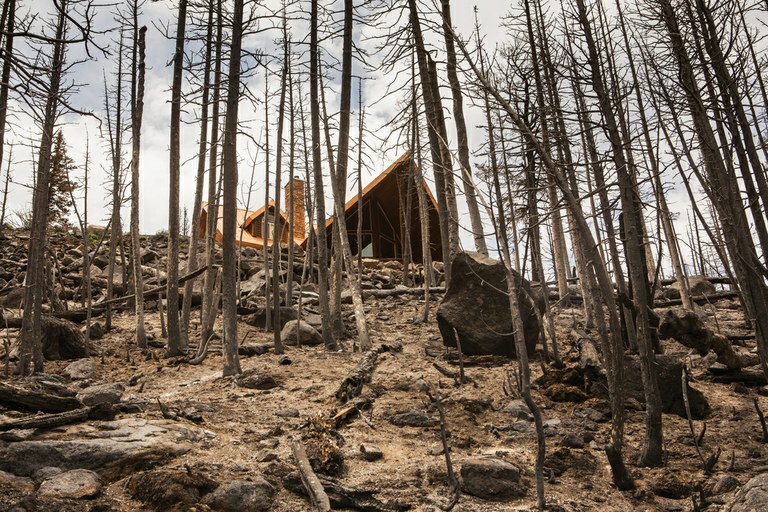 A house that was spared from the Brianhead Fire in Utah, which started in June and covered more than 70,000 acres. Suppression efforts cost more than $35 million. Fire agencies devote much of their resources to protecting structures, particularly as the wildland-urban interface gets more developed. Deploying aircraft is also a huge cost in fighting wildfires. Congress has considered two main options: increasing the budget cap and using Federal Emergency Management Agency funds. The Wildfire Disaster Funding Act — introduced in the House by Simpson and Rep. Kurt Schrader, D-Ore., and in the Senate by Sen. Ron Wyden, D-Ore., and Sen. Mike Crapo, R-Idaho — takes the first approach. Currently, the Forest Service and the Interior Department are the only federal entities that must fund disasters through their discretionary budgets rather than from an emergency fund. This bill would let the Forest Service and Interior Department adjust their caps upward, allowing them to access disaster funding rather than borrowing from other programs. First introduced in 2013, the bill has received wide congressional support this year. “Coming to agreement on the right approach slowed things down,” notes Cecilia Clavet, senior policy advisor at The Nature Conservancy. The problem for the Wildfire Disaster Funding Act, says Simpson, has always been that “the budget committee doesn’t like cap adjustments.” But FEMA funding has its problems, too: Those funds are typically used for single-event disasters. “A hurricane comes, you know what the damage is,” he says. “The problem with wildfires is they happen all year.” Pursuing FEMA funds on a case-by-case basis would also force wildfire to compete with other natural disasters. More and more legislators involved in this issue are now leaning toward the budget cap adjustment approach, Clavet says. The issue of forest management is more complicated. Several Republican members of Congress “would like to see forest management wrapped up with fire funding,” Clavet says. But even among those legislators, there is little agreement over what provisions to include. Logging provisions and attempts to streamline environmental laws prove particularly divisive. Many Democrats oppose the Resilient Federal Forests Act, a bill introduced by Rep. Bruce Westerman, R-Ark., which passed in the House on Nov. 1. It would increase the size of categorical exclusions that hasten the permitting process for thinning and logging projects. Democrats are concerned that the legislation would use wildfire prevention to fast-track logging projects and limit environmental review. Mike Anderson, senior policy analyst at The Wilderness Society, says such bills face resistance from conservation groups due to what they see as “an attack on bedrock environmental laws” like the National Environmental Policy Act and the Endangered Species Act. Anderson expects there will be more pushback against bundling forest management provisions with fire funding in the Senate, where a companion bill to Westerman’s has not been introduced.